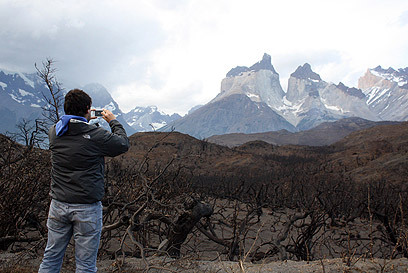 CNN Chile reported Saturday that a 23-year-old Israeli tourist was arrested on suspicion he caused a mass fire in the country's Torres del Paine National Park which has been raging for the past three days. He has been identified as Rotem Singer from Ness Ziona, and was released under restrictions. Juan Melendez, head prosecutor in the region confirmed that an Israeli suspect had been arrested on alleged negligence. Singer is suspected of lighting toilet paper on fire and failing to put it out properly. Melendez noted he is not likely to get a harsh sentence. The Associated Press reported that the suspect acknowledged a part in negligently allowing the fire to start. According to restrictions set by the court, Singer is prohibited from the leaving the area he is currently staying at. If convicted, he faces 41-60 days in prison and a $80-$300 fine. Reports in Chile suggest that a number of other Israeli tourists were questioned in connection to the affair. Israel's Ambassador to Chile David Dadon instructed the Israeli consul to travel to a city adjacent to the national park to handle Singer's case. Gilad Harel, Singer's grandfather told Ynet: "We know very little, he phoned himself and said he's in custody and facing a hearing. He sounded scared." Harel said this is the first time his grandson has been arrested and noted his case is being argued by a local attorney. "From what I gathered he was on a trek with four friends, three were released and he remained in custody." A friend of the family said, "He's a good kid, even a bit of a nerd. I don't believe he did this. If anything I believe he tried to put out the fire." The massive wildfire has thus far ravaged tens of thousands of acres of pristine Patagonia and forced authorities to close the popular national park. Hundreds of firefighters are fighting the blaze in far-southern Chile. Authorities evacuated 400 tourists, most of them foreigners. Officials say the fire is likely to continue spreading. Chilean President Sebastian Pinera cut his vacation short to meet with his top aides on Friday and discuss ways of containing the blaze. Some 11,000 hectares (27,200 acres) of woodland and scrub, nearly four percent of the total area of the park, has already been destroyed by the blaze, which more than quadrupled in size in less than 24 hours. 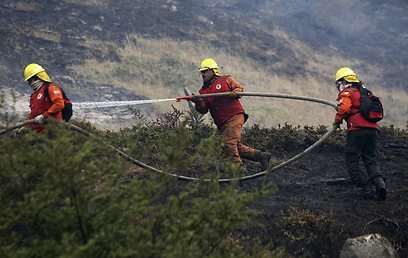 See all talkbacks "Israeli suspected of causing Chile wildfire"